» Allu Arjun To Change His Title Card ? Social media has become a huge platform for netizens to discuss on various topics these days. Discussions about the movies.. especially their favorite stars will be always going on. Similarly, some interesting discussions are happening regarding the title of Allu Arjun. 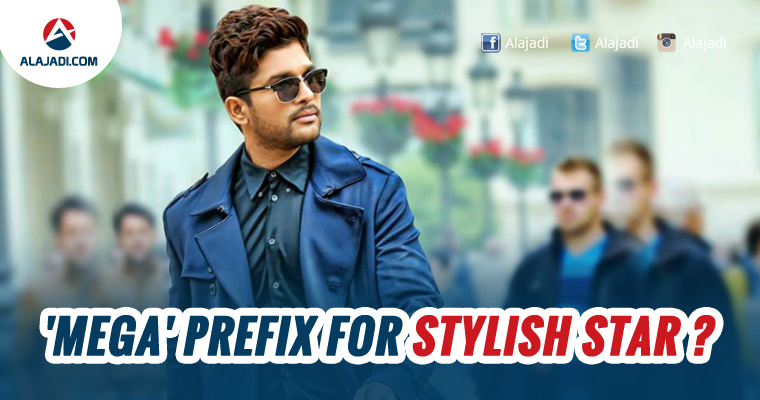 We all know that fans call him Stylish Star fondly because of his style quotient. Recent discussions is the social media suggest that Allu Arjun has been thinking of changing his title to Mega Stylish Star to appease a section of mega fans. Going by the word of reliable sources, these proved to be nothing but baseless rumors taken birth during the discussions of some mega fans. It is heard that because of Allu Arjun’s popularity, buzz is that he is setting up new Allu fans groups, which triggered the insecurity of the mega fans. From then, a cold war has started between the two fan groups. Now, to pacify the mega fans, Allu Arjun is planning to come under the mega family group. Allu Arun has been a great fan of Megastar and never shied away to reveal his admiration for Chiru. Even though a section of mega fans are upset with Allu Arjun with controversies like ‘Cheppanu Brother’ episode, he has been remaining silent these days as he doesn’t want to involve in such controversies any more. In fact some opine that, he was a mega hero, he is a mega hero and he will be a mega hero..and a big star hero from Mega family who has pan South India appeal.. no questions on that. There is no need for him to add a prefix Mega at this juncture to prove again that he is a mega hero. He has a huge fan base in some other languages on par with their superstars. It is also a well known fact that Allu Arjun always has been loyal to the mega family, especially Chiranjeevi and many times, he confessed it openly on public platforms. So, then shed away these rumors about the title card and confirmed that he remains as Stylish Star forever.